Döner kebab (Turkish: döner kebap or döner kebabı, literally "rotating roast"), is a Turkish dish made of lamb meat cooked on a vertical spit and sliced off to order. Two derived dishes are called shawarma in Arabic and gyros in Greek, although ingredients and sauces differ. In English, the term kebab in some countries refers specifically to döner kebab. Left: The döner meat is being sliced from a rotating spit. Note the cast iron plate behind the spit, which is used to cook the meat. There are many variants in the composition of the meat, the ways of serving it, and the garnishes. The meat used for döner in Turkey is mostly lamb, but the chicken variant has also made its way in the very large Turkish street food milieu. 1. The more common and authentic method is to stack marinated slices of lean lamb meat onto a vertical skewer in the shape of an inverted cone. The meat is cooked by charcoal, wood, electric, or gas burners. The döner stack is topped with fat (mostly tail fat), that drips along the meat stack when heated. At times, tomatoes, and onions are placed at the top of the stack to also drip juices over the meat, keeping it moist. 2. 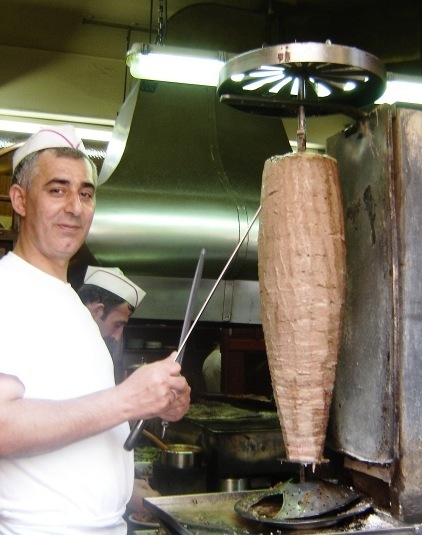 In Western Europe, meat for döner kebab is often industrially processed from compressed ground meat containing a mixture of different meat kinds from various animals, making the specific contents less traceable. In modern Turkey, the döner is served in diverse ways as main courses or street snacks. 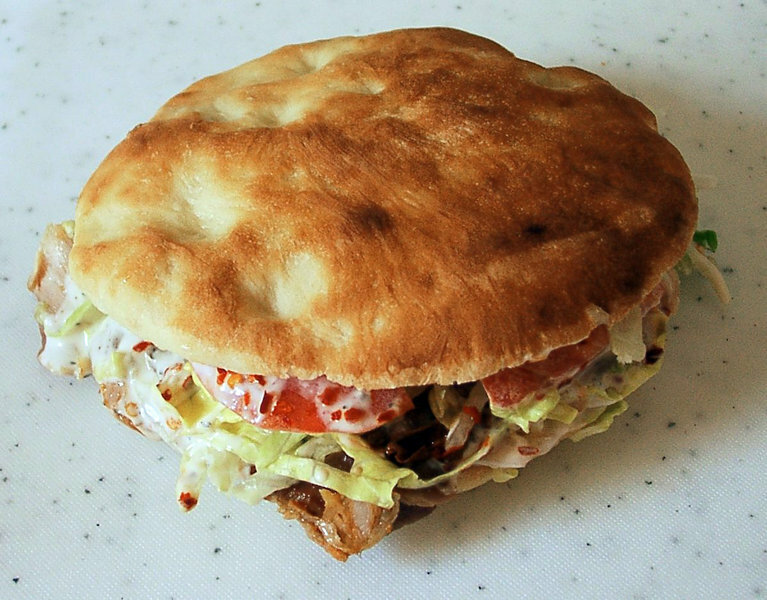 Outside of Turkey, generally a döner sandwich is served with a salad made from shredded lettuce, tomatoes, and onions—often also with cabbage and cucumbers. Left: Döner kebab sandwich served in a thick pita. Usually there is a choice between a hot sauce, a whiter yoghurt sauce containing garlic (tarator/tzatziki), and a dairy sauce containing herbs. Most döner vendors in Europe also have French fries which can be served as a side or wrapped with the meat and salad. Sometimes more varied ingredients are available, such as hummus (chick pea paste), tahini-based tarator, or Turkish white cheese. In Russia döner kebab is usually called shaurma (Central Russia) or shawerma (North-West). It is widespread and is usually made in booths or small cafes. There are two basic types: in pitah (a type of bun) or in lavash (thin round cake, in which it is packed). Types of meat from which it is usually made are chicken and pork. Other meat is seldom used for döner. Typical recipe includes meat, cabbage and/or carrot salad, cucumbers and/or tomatoes and two types of sauces: ketchup and a type of spicy youghurt (its recipe is usually strictly secured by shaurma makers, called shaurmen).